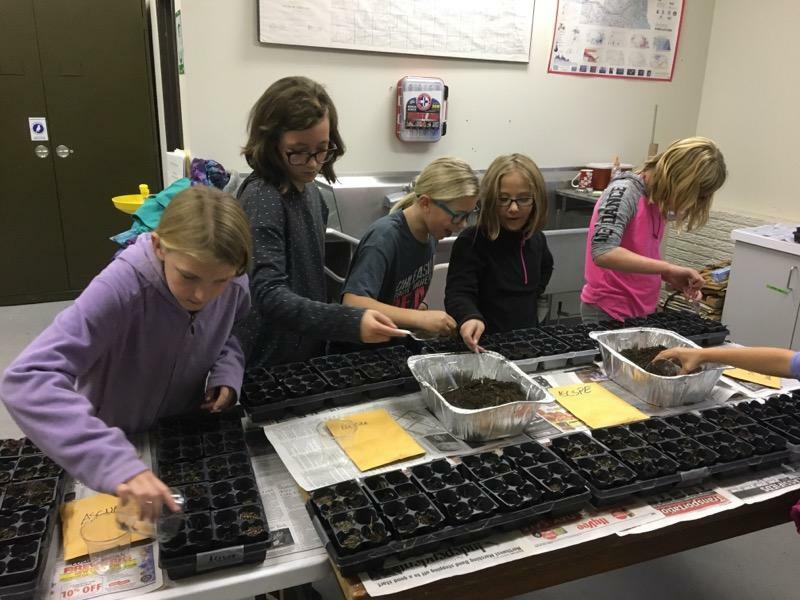 On Monday evening, Juniors from the Shelton Girl Scout Troop 946 came out to the Crane Trust to learn about flowers and pollinators, fulfilling requirements for nature badges. The girls toured the Crane Trust herbarium and enjoyed learning about different kinds of plants throughout the wet meadows and prairies on Mormon and Shoemaker Island. Each scout learned about butterflies species of concern, the Monarch and Regal Fritillary, and helped plant and take home some native seeds. Common violets were planted as a host plant for Regal Fritillary caterpillars, while Swamp, Whirled, Common, Showy, and Butterfly Milkweeds were planted to support Monarch caterpillars. Other pollinator favorites such as Shell-leaf Penstemon, Purple Prairie Clover, and Prairie Gentian were also planted. The seeds will germinate and grow in the newly finished Crane Trust Educational Greenhouse, funded by a PIE Grant from the NET and the Nebraska Academy of Sciences. The greenhouse was designed as a platform to share with students and youth programs an appreciation for natural resources, providing hands-on experience with land stewardship and the importance of species conservation. Since its construction, the greenhouse has been a hub for several other local groups to come out and participate in similar activities, including seed collecting and planting of a pollinator garden.